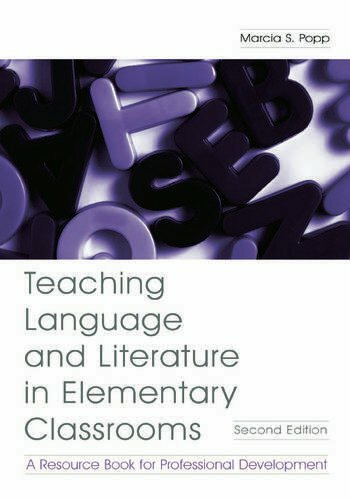 The goal of Teaching Language and Literature in Elementary Classrooms: A Resource Book for Professional Development, Second Edition is to help the beginning teacher create a classroom environment that integrates literacy development with learning in all areas of the curriculum. Theoretically based, well organized, and practical, this text identifies the major components of an integrated language program and describes and illustrates skills teachers need to implement this kind of program in their own classrooms. It is uniquely designed as a handbook for beginning educators that serves both as a text and as a professional resource to be carried into the first year of teaching. The narratives in this text, and the accompanying instruction for preparing to teach, are included for every elementary instructional level. A consistent chapter format is used to help readers move from a direct experience of a classroom narrative, to step-by-step descriptions they can follow to implement these activities in their own classrooms. A rich array of interactive pedagogical features is provided. *New appendices, designed to provide information and resources for instructional support. Contents: Preface. Language and Literature in Three Classrooms. Reading Aloud: Literacy Begins With Listening. Independent Reading: Exploring on Their Own. Creating a Literature Base. Guided Reading. Mini-Lessons. Individual Reading Conferences. Writing to Create Meaning. Listening and Speaking. The Languages of Learning in the Content Areas. The Languages of Expression--Play, Media, and the Fine Arts. Appendices: Minimizing Distractions to Learning. Book Selection Literature. Awards for Children's Literature. Student Forms and Guidelines. Teacher Forms and Guidelines. "...provides teachers with lots of practical suggestions and useful information related to the inclusion of children's literature in teaching activities."